NEW TRAVEL HOSTING JOB: BELGIUM TV DOCUMENTARY ABOUT SAKURA SEASON! ARI OG PER PROGRAM WITH ARI BEHN. Spring is in the air… and I’m hosting yet another travel TV show! This time, it’s for Belgium’s national broadcast station, VRT (Vlaamse Radio en Televisieomroep). The documentary is about cherry blossom season in Tokyo: sakura culture, festivities and fun. Can’t wait! Once again, my First Mate Naomi will be making arrangements for the TV shoot. 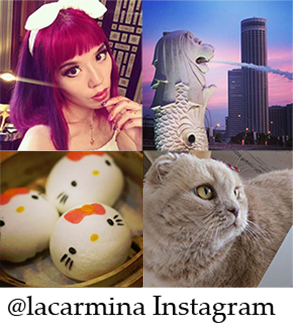 (She took most of the photos in this post). Our company, La Carmina & The Pirates, offers “fixing” services to film and TV companies. We take care of location scouting, translation, scheduling and more. 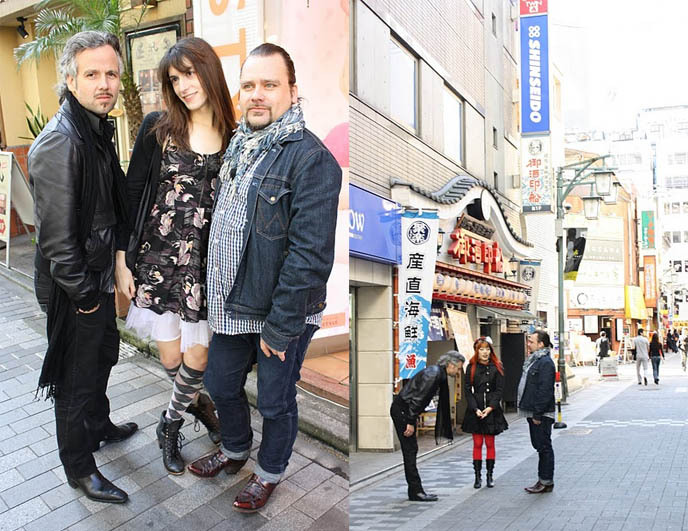 If you’re coming to Tokyo, Japan and want to hire us, come check out our website. 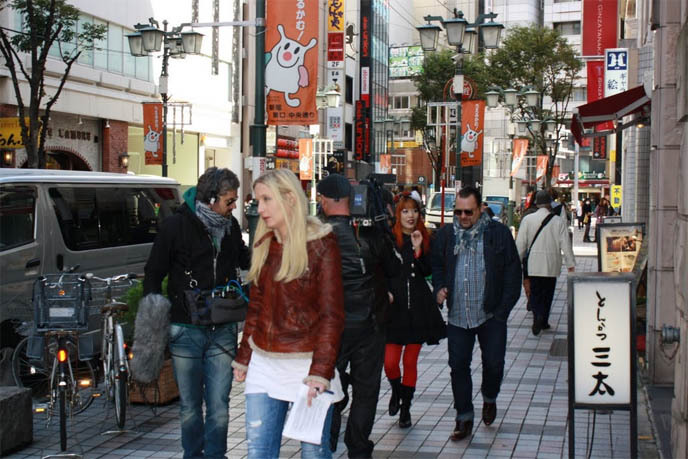 Last fall, NRK (Norway TV) hired us for a shoot in Tokyo about Japanese love and host clubs. One of the stars is Ari Behn, the Prince of Norway! The other is famous photographer Per Heimly, who shot album covers for black metal band Dimmu Borgir. It quite surreal, running around Tokyo with this pair. Thank you to everyone for your enthusiastic messages about the show! Naomi and I are tickled pink that you enjoyed it. Here are some behind-the-scenes photos from the filming. We were quite the motley crew. 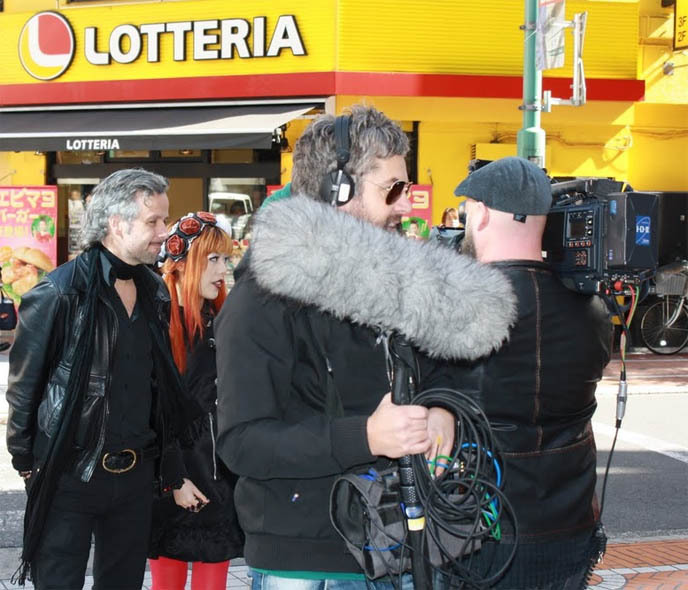 Cameraman, sound man, producer, photographer-host, Mistress of the Dark, prince-host. Ari and Per were great to work with. They’re interested in the people and culture around them, and always up for having fun. I gave them lessons on how to bow properly. Tokyo is heaven for photographers. Per kept clickity-clicking his camera. So far, I’ve worked with TV shows from Australia, Japan, Netherlands, Norway, France, USA, Canada — and now, Belgium. I feel fortunate I am able to do TV hosting. However, I feel I’ve only gotten started — there’s so much more I’ve yet to accomplish! 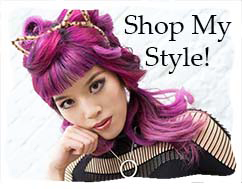 Interested in featuring your clothing/brand/product on one of my TV shows, or in a blog post? Send me an email and we’ll chat. great photos. I watched the Norway show and you were superb in it. Cute headdress! I want one. Let me know if there is anything i should bring you from Norway, next time i came over. ahha the crew gave us Norwegian chocolates – delicioussssssss. yessss it is, i bring u some different sorts. Could u send me ur priv e mail adress by sending a mail thru facebook? so its easyer to be in contact. WOW, Belgium. I live in the Netherlands and I hope I can see this program!!!!!!! Ooooh awesome!! I hope so! I’ll have video clips up eventually, but I hope you can catch it on VRK. I saw you in the french reportage “Toqué de Tokyo” with Antoine de Caunes, I read your blog by past, and saw you in this report was very fun! Your style is totally awesome! Im going to Tokyo in April, I really hope I can meet you a day, maybe in Deca bar. Thanks so much!! <3 I hope you have fun in April! hey that’s awesome! I’m in Tokyo in April, will you be there then? I’d love to meet you and gift you one of my cute purses! I saw the second airing of Ari og Per. great! Hmmm, I thought NRK was somehow free to watch.. But Ari og Per isn’t. Why? Do they need to protect their royalty or something??? I look forward for the Belgian show, because my TV does broadcast VRT (yay). What is the name of the show? I know VRT has some realy good travelshows. Hm, not sure… There was a link to the video of the episode, but I wasn’t able to watch it. Oh well, the DVD will come soon! Not sure what the name of the VRT show is. 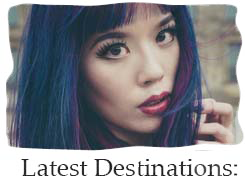 It’s a travel series about festivals worldwide. YES we’ll be filming at many locations!! Oops. It looks like I found the sad creature site.